Place a clean shop cloth beneath the brake master cylinder reservoir to catch brake fluid spills. With the ignition OFF and the brakes cool, apply the brakes 3–5 times, or until the brake pedal effort increases significantly, to deplete the brake booster power reservoir. If you have performed a master cylinder bench bleeding on this vehicle, or if you have disconnected the brake pipes from the proportioning valve assembly or the brake modulator assembly, you must perform the following steps to bleed air at the ports of the hydraulic components. Fill the master cylinder reservoir to the maximum-full level with the approved brake fluid from a clean, sealed brake fluid container. If removal of the reservoir cap and diaphragm is necessary, clean the outside of the reservoir on and around the cap prior to removal. With the brake pipes installed securely to the master cylinder, proportioning valve assembly, or the brake pressure modulator valve assembly, loosen and separate one of the brake pipes from the port of the component. For the proportioning valve assembly or the brake pressure modulator valve assembly, perform these steps in the sequence of system flow; begin with the fluid feed pipes on the master cylinder. Allow a small amount of brake fluid to gravity bleed from the open port of the component. Connect the brake pipe fitting to the component and tighten securely. Have an assistant slowly depress the brake pedal fully and maintain steady pressure on the pedal. Loosen the same brake pipe fitting to purge air from the open port of the component. Wait 15 seconds, then repeat steps 3.3–3.7 until all air is purged from the same port of each component. With the brake pipe fitting installed securely to the master cylinder, proportioning valve assembly, or brake pressure modulator assembly after all air has been purged from the first port of the component that was bled, loosen and separate the next brake pipe from the component and repeat steps 3.3–3.8 until each of the ports on the component has been bled. After completing the final component port bleeding procedure, ensure that each of the brake pipe fittings is properly tightened. Fill the brake master cylinder reservoir to the maximum-fill level with the approved brake fluid from a clean, sealed brake fluid container. Ensure the master cylinder reservoir remains at least half-full during this bleeding procedure. Add fluid as needed to remain the proper level. Set up the brake pressure bleeder following the manufacturer's instructions. Open the brake pressure bleeder fluid valve to allow pressurized brake fluid to enter the brake system. Wait approximately 30 seconds, and then inspect the entire hydraulic brake system in order to ensure that there are no existing external brake fluid leaks. Any brake fluid leaks identified require repair prior to completing this procedure. Install a proper box-end wrench onto the RIGHT REAR wheel hydraulic circuit bleeder valve (1). Install a transparent hose over the end of the wheel hydraulic circuit bleeder valve (1). Submerge the open end of the transparent hose into a transparent container (2) partially filled with the approved brake fluid from a clean, sealed brake fluid container. Loosen the bleeder valve to purge air from the wheel hydraulic circuit. Allow fluid to flow until air bubbles stop flowing from the bleeder, then tighten the bleeder valve. Tighten the wheel circuit bleeder valve securely. Install a proper box-end wrench onto the LEFT FRONT wheel hydraulic circuit bleeder valve. Install a transparent hose over the end of the wheel hydraulic circuit bleeder valve, then repeat steps 10–12. Install a proper box-end wrench onto the LEFT REAR wheel hydraulic circuit bleeder valve. Install a proper box-end wrench onto the RIGHT FRONT wheel hydraulic circuit bleeder valve. After completing the final wheel hydraulic circuit bleeding procedure, ensure that each of the 4 wheel hydraulic circuit bleeder valves is properly tightened. Close the brake pressure bleeder fluid valve. Remove the brake pressure bleeder from the brake master cylinder reservoir. Fill the brake master cylinder reservoir to the maximum-full level with the approved brake fluid from a clean, sealed brake fluid container. Slowly depress and release the brake pedal. Observe the feel of the brake pedal. 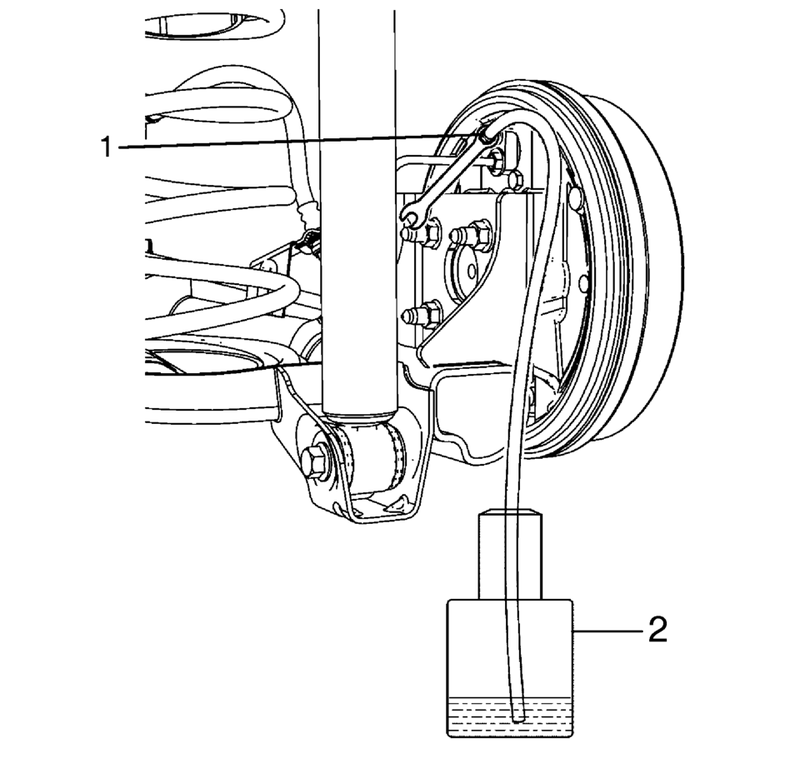 Inspect the brake system for external leaks. Refer to Brake System External Leak Inspection. Turn the ignition ON, with the engine OFF. Check to see if the brake system warning lamp is illuminated. If the brake system warning lamp remains illuminated, refer to Symptoms - Hydraulic Brakes.